It's hard not to love a Julia Donaldson book, isn't it? 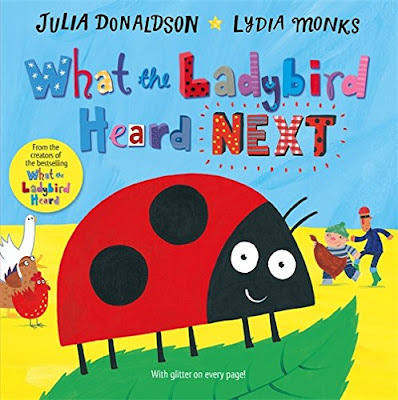 What the Ladybird Heard Next is the latest collaboration between author Julia Donaldson and children's illustrator Lydia Monks and it is the sequel to What the Ladybird Heard (which I will admit, I have not yet read). As always, Julia's ability to tell a story using rhyme is awe-inspiring. I really enjoy reading her rhyming tales to my girls (not all children's authors can pull of a rhyme well). The story centres around a farmyard full of animals who hatch a plan to divert two criminals determined to steal their hen. Lara (who also hasn't read the prequel) was a bit surprised to find out quite how little the ladybird features in the story but we did have fun trying to spot her on every single page...however tiny she may be. Every page in the hardback version of What the Ladybird Heard Next features glittery stand-out elements which adds to the interactivity of the book - it encourages you to touch and explore each page and helps you see things in the illustrations that you may not have noticed otherwise. In this story Julia Donaldson cleverly mixes fantasy with reality - the girls loved the idea of a Snuggly Snerd on their farm and we talked about what type of creature it might be. But perhaps the most popular part of the story in our house is, unsurprisingly, the part of the story where the criminals end up digging their way through an enormous pile of poo! Much hilarity ensues at this point in the rhyming tale. What the Ladybird Heard Next is a wonderful story book with appeal for children of all ages. I think it would make a perfect story to read to a class of KS1 children.